MiraDry Treatment is a safe, non-invasive procedure that eliminates sweat glands in the underarm area, providing a long lasting solution to excessive underarm sweating. Starting from $3,599 for two treatments and from $1,999 for a single treatment. Are You a MiraDry Candidate? Does excessive underarm sweat interfere with daily activities such as work and social events? Are you tired of worrying about if someone will notice your sweat stains? Do you choose fabrics, colours and styles that do not show sweat easily? If you answered “Yes” to any of the above questions, then MiraDry Toronto treatment at our Toronto sweat clinic may be what you are looking for. You will be required to have your underarms shaved prior to MiraDry treatment. This and any other do’s and don’ts before treatment will be discussed during your MiraDry consultation at SpaMedica in Toronto. Please note the MiraDry procedure for excessive underarm sweating is only performed on adults aged 18 and over. The procedure is meant to treat the underarms and not anywhere else on the body. Millions of people suffer from excessive underarm sweating (Axillary Hyperhidrosis). Excessive sweating and specifically excessive underarm sweating is a daily struggle and can interfere with many aspects of your life. If this applies to you, then MiraDry treatment with Toronto’s excessive sweating experts is what you need. What is excessive underarm sweating? At least 1% of the global population suffers from excessive underarm sweating. Excessive underarm sweat is a daily struggle since it interferes with almost every aspect in life. Excessive underarm sweat may interfere with a person’s work and social life. These settings often cause people to feel anxious and frustrated over possibly ruining their clothes with sweat stains. This condition can affect a person’s emotional well-being and self-image. It can impact how they feel about themselves and cause them to worry about how others view them. If you have excessive underarm sweat, you may be suffering from a medical condition known as axillary hyperhidrosis. Axillary hyperhidrosis is a condition in which the underarm sweat glands are overactive, producing much more sweat than is needed to cool the body. If you think you may suffer from this condition, speak to a physician and ask if the MiraDry procedure is right for you. Why do our underarms sweat? Our bodies sweat to regulate body temperature. Armpits have two sweat glands known as the eccrine and apocrine sweat glands. Underarm sweat is produced through these glands, which are located just below the surface of the skin. The eccrine glands secrete a clear, odourless fluid and respond to elevated body temperature by helping to cool the body. The apocrine glands produce a milkier fluid that is odourless until it combines with the bacteria on skin. This is what gives underarm sweat its distinctive odour. For those who sweat excessively, these underarm sweat glands are overactive. The glands turn on when they should not and producing much more sweat than is needed to cool the body. Excessive sweaters can produce four or five times more sweat than what is considered normal. What is our recommendation as an excessive underarm sweating treatment? At SpaMedica Toronto, we have a specific procedure, the MiraDry treatment procedure, to help target and alleviate patients from excessive underarm sweating. The procedure is safe and clinically proven to provide a significant reduction of underarm sweat. It is a lasting solution and wonderful excessive sweating treatment that can solve your excessive underarm sweating and embarrassment. 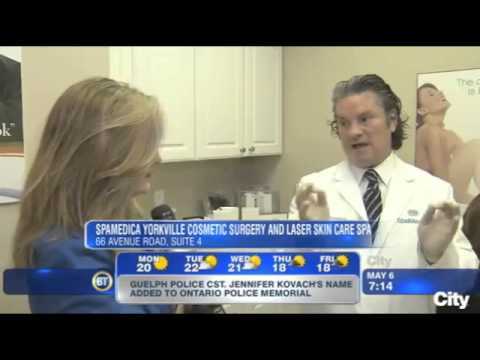 The MiraDry system is a quick, non-invasive procedure performed at SpaMedica in Toronto, ON. The MiraDry treatment procedure uses an FDA cleared non-invasive technology to provide lasting results. The procedure uses precisely controlled energy to eliminate underarm sweat glands. The sweat glands do not grow back once removed, providing exceptional and lasting results. Other treatment options like antiperspirants and toxins only temporarily disable the sweat glands for specific durations. Surgery is another option, but that involves risks. The MiraDry treatment in procedure is a non-invasive solution that provides lasting results. Can you tell me more about the MiraDry treatment procedure? The MiraDry Toronto procedure is a lasting and non-invasive solution for excessive underarm sweat available at SpaMedica. A well-trained physician will perform the procedure in an office, without having to make surgical incisions or cuts. There is customized treatment for each underarm with multiple placements of the MiraDry System. The MiraDry System delivers electromagnetic energy non-invasively to the area where the sweat glands reside. For your comfort, your underarms are numbed before the procedure. For the best, lasting results, you should undergo two procedures three months apart. Each procedure appointment usually lasts about an hour. You can expect minimal to no downtime following the procedure. You should be able to return to normal activities or work right after your MiraDry treatment. Exercise and training can be resumed after several days. It is normal to have localized soreness and swelling that clears within a few weeks. Some patients may experience temporary, short-term altered sensation in the skin of their underarms or upper arms, which gradually disappears. Find out if the MiraDry treatment is right for you by speaking to our SpaMedica doctors and staff in our clinic in Toronto. Please note the MiraDry procedure for excessive underarm sweating is only performed on adults aged 18 and over. The procedure is meant to treat the underarms and not anywhere else on the body. Your body contains over 4 million sweat glands and only about 2% is located in the underarms. The eliminated underarm sweat glands will not affect the body’s ability to cool itself. What happens after the MiraDry procedure? You can expect minimal to no downtime following the procedure. You will likely be recommended a mild over-the-counter pain medication and instructed to use ice packs for a few days. You should be able to return to normal activities or work right after the procedure. Exercise and training can be resumed after several days. It is normal to have localized soreness and swelling that clears within a few weeks. Some patients may experience temporary, short-term altered sensation in the skin of their underarms or upper arms, which gradually disappears. What results can I expect from MiraDry treatment? Most patients report a dramatic reduction of their underarm sweat. According to a recent clinical study, the average underarm sweat reduction was 82%. To maximize results, two procedures spaced three months apart are required. As with any medical procedure, results will vary by person. (needs more detail). After treatment, you may experience temporary swelling, soreness, tingling and numbness in the treated area. These sensations typically clear up within a few days to a few weeks. There have been no reports of permanent side effects; however, some patients experience short-term altered sensation in the skin of their underarms or upper arms, which gradually disappears. Please consult with your physicians for all possible side effects and to see if MiraDry is right for you. You should expect to have lasting results. The sweat glands do not come back or regenerate after they have been eliminated, which solves the problem of excessive underarm sweating. One or two MiraDry treatments in Toronto will result in permanent reduction of hair in the armpits. Shaving will no longer be necessary. MiraDry reduces and eliminates oil and odour glands. Feel more comfortable in social and professional interactions. Have no limits to what colour you wear or what type of clothing and change less frequently. Other options if MiraDry is not as effective as desired. For the rare occasions that axillary hyperhidrosis patients do not see the permanent results with MiraDry, Dr. Mulholland offers several minimally invasive options to heat and destroy the sweat glands. Botox Injectable treatment for excessive underarm sweating. Learn more about Botox Injectable Hyderhidrosis treatment here. Under-the-skin thermal treatments which are safe and effective and performed under local anesthesia with a single treatment, including the FaceTite™, SmartLipo™ and VASER® lipo. MiraDry treatment costs start from $3,599 for two treatments and from $1,999 for a single treatment. If you are interested in having a consultation with the SpaMedica team and Dr. Mulholland for MiraDry Toronto treatment, simply fill out our online consultation request form or call SpaMedica to schedule a consultation. Dr. Mulholland has been treating patients with excessive armpit sweat for 20 years, initially with Botox Injectable. He has accumulated the most experience with MiraDry in Canada over the past five years.